The Jim Henson Company is moving in a new direction with Puppet Up. A special will air November 20 and TBS has ordered 30 episodes of Puppet Up for TBS broadband. A late night talk show is also in the works. As a practitioner of puppetry, the Jim Henson Company doesn’t often ply its trade at comedy clubs. But the puppet show the company staged for a few weekends this summer at the Improv in Los Angeles wasn’t a typical production. For one thing, the puppeteers weren’t hidden. They performed in full view, with their puppets held over their heads for a camera to capture and project to television monitors next to the stage. And instead of following a script, the Henson troupe improvised skits, with audience members encouraged to chime in their own story ideas. The Cast of Puppet Up: Allan Trautman, Brian Henson, Paul Rugg, Julianne Buescher, Drew Massey and Victor Yerrid. This being a comedy club, those ideas weren’t exactly what the Henson Company might have used on “The Muppet Show” or “Sesame Street.” Asked to suggest a career for a skit about a job interview, one audience member proposed proctology; the performance featured a large gorilla puppet re-enacting the kind of painful probes common in that medical specialty. Who would have thought that the company that introduced the phrase “It’s not easy being green” would be working blue? It’s just one of the ways a production company known for beloved child-friendly franchises is trying to find a new creative spark. He is making progress. TBS is taping a Henson improv performance scheduled for Wednesday at the Comedy Festival in Las Vegas, and will show it as an hourlong special titled “Puppet Up! Uncensored” on Nov. 20. In addition TBS has ordered 30 episodes of "Uncensored" for its coming broadband channel. 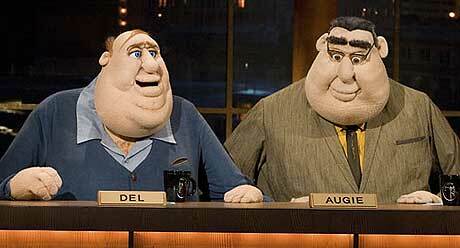 The network is also considering a semi-improvisational late-night talk show in which everyone is a puppet except for the human celebrity guests. With its new adult direction, the company is latching onto a cable trend. MTV2’s “Wonder Showzen” has made ample use of the genre, and the channel is also bringing back the puppet pranksters of “Crank Yankers,” which originally ran on Comedy Central. IFC has revived “Greg the Bunny” to parody popular films, and next year Starz is importing a different racy rabbit, “The Bronx Bunny,” from British television. Back at Henson the multiple projects make for a busy time at its headquarters, a five-acre lot in Hollywood that doesn’t quite fit in with the seedier elements of the neighborhood, just south of Sunset Boulevard. Inside a converted farmhouse on the grounds, an employee creates a new female character, Gina Cappellini, meant for one of the resident puppeteers, Julianne Buescher, who slides the puppet-in-progress over her hand. Gina’s eyes have yet to be glued on; they’re still trying to perfect her sloe-eyed expression with the help of an Angelina Jolie photo pinned to the wall. The Henson Company has been at this address since 2000, the latest tenant in the bungalows Charlie Chaplin built for his own studio in 1917. 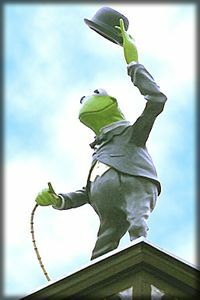 The current occupants pay tribute to him at the central gate with a statue of Kermit the Frog dressed in Chaplin’s signature bowler and cane. But Kermit is no longer a priority for Mr. Henson since he sold the rights to the Muppets franchise to the Walt Disney Company in 2004. While Disney is likely to call on the Henson Company to produce future incarnations of the Muppets, their corporate adoption has freed Mr. Henson to focus on creating new characters that could become franchises in their own right. His company remains active in other children’s properties — like development of a feature-film adaptation of its 1980s show “Fraggle Rock” — and is also interested in coming up with the kind of production that appeals to all ages, as its syndicated variety series “The Muppet Show” did on CBS stations from 1976 to 1981. There were several attempts in the 1980s and 1990s to recapture that magic, with mixed results. That’s when the notion that improvised comedy could be a source of creative resurgence arose. “One thing that occurred to me in the last few years was that that spark wasn’t there anymore and that we were really sticking to the script,” Mr. Henson said. Improv was also something of a necessity: the company was having difficulty attracting writers to dream up puppet-based material. Mr. Henson also wanted to see his puppeteers ad-libbing more, the way the earlier generation that gave voice to “The Muppet Show” often did. A late-night talk show with puppet hosts (and human guests) is one of several projects on the Jim Henson Company’s drawing board. The first few weeks of training were difficult, Mr. Bristow remembered, and one discouraged puppeteer even dropped out. Puppetry doesn’t exactly lend itself to improvisation, which traditionally emphasizes eye contact between the performers. The Henson puppeteers have to stare at monitors on the floor in order to see their puppets move; their brand of improvisation forces them to listen intently. “At first it was pretty challenging, to say the least,” Ms. Buescher recalled. In time Mr. Bristow felt they were ready for a performance. When Mr. Henson recommended his lot’s soundstage, Mr. Bristow had little idea that it would not be an intimate gathering. “They rented bleachers and served wine, cheese and crackers,” Mr. Bristow remembered. “No pressure or anything.” The crowd included a representative from the U.S. 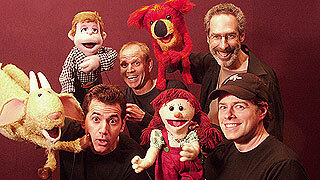 Comedy Arts Festival, who invited the puppeteers to perform in March in Aspen, Colo.